I love compression gear. Calf sleeves, tights, socks…you name it and I’ll wear it while I’m running. I truly believe that compression helps thwart muscle fatigue and boost recovery time. I had been wanting to try out a pair of compression arm sleeves for quite some time and as luck would have it, Xploritall was provided with some sample products from 180s to test out. 180s is based in Baltimore and what a fun coincidence! So am I! This company has a great cold weather and warm weather active wear line for both men and women that includes arm sleeves, calf sleeves, hats, gloves, ear warmers (one variety of which contains Bluetooth technology! how cool is that!? ), training jackets, and more. What with the weather hopefully deciding to get warmer at some point, the QuantumCool Compression Fit Arm Sleeves caught my eye. 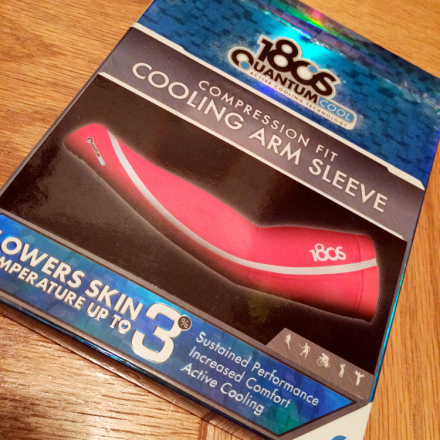 It gets disgustingly hot and humid around here in the summertime and these sleeves claim to promote “active cooling technology”, plus that compression factor that I had so been wanting to test out. They are a nylon/spandex blend (73%/27%) that feels almost like a second skin and allows free range of motion. Although the material does not feel like it would be particularly moisture-wicking, it absorbs as you sweat creating an overall cooling effect. QuantumCool also implements a pulse point cooling element that is located on various pulse points, supposedly increasing the cooling rate of the body. Unfortunately as far as compression is concerned I didn’t really feel it all that much and the pair I have is an extra small. However to be fair, I also have string bean – albeit TONED string bean – arms that nary a iPod arm band of any size will comfortably fit around so I kind of anticipated this problem. Other people would probably have a lot better luck in the compression department. And as added bonus, they look awesome with my tattoo. My first run in them was my 18 miler. I had on a tech shirt, the sleeves, then a running jacket on top of that because it was about 40 degrees when I left the house. I had heard some people mention that arm sleeves made them feel clammy so I was a little concerned that I was going to get uncomfortable or too hot having them on. I’m guessing those people weren’t wearing QuantumCool. They work! It almost felt like I had a fan blowing cool air up inside the sleeves of my jacket. It was especially noticeable in the crease of my elbows where I usually get really sweaty from having my arms bent. I might have been sweating there, but I didn’t notice it. Probably because the material was doing the work that it advertised and using my perspiration to cool my arms down. I was probably the most comfortable temperature wise than I have been on any run in a long time. I’ve worn them since with similar results, but the real test will be taking them out today for an otherwise sleeveless run outside in mid-70 degree temps. The material provides great protection from the sun as well – UPF 50+ – and I have a feeling that I’m in for some seriously weird farmer tans this summer. I may have to pick up a second pair! They have 6 colors to choose from and I think I might need that bright yellow. 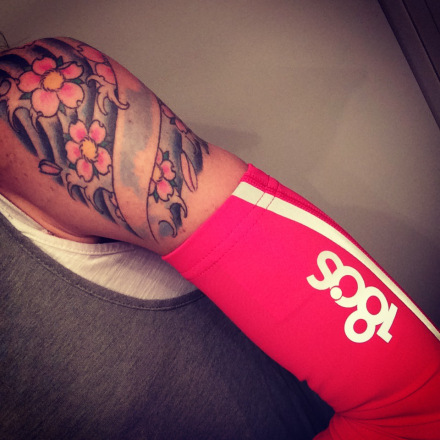 Have you ever run with compression arm sleeves? What did you think? Lauren is the mom of a toddler who has somehow found time to take the running world by storm, tearing up her age bracket in every race she enters. 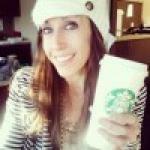 She reviews running related products on her blog, Run Salt Run.